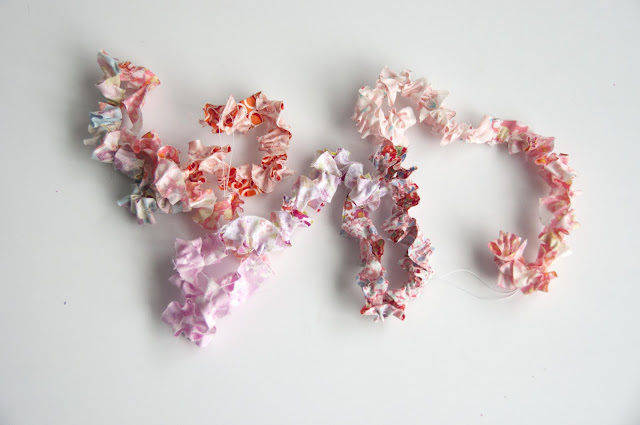 This is a great project for using up some of the fabric scraps you've been hanging onto. 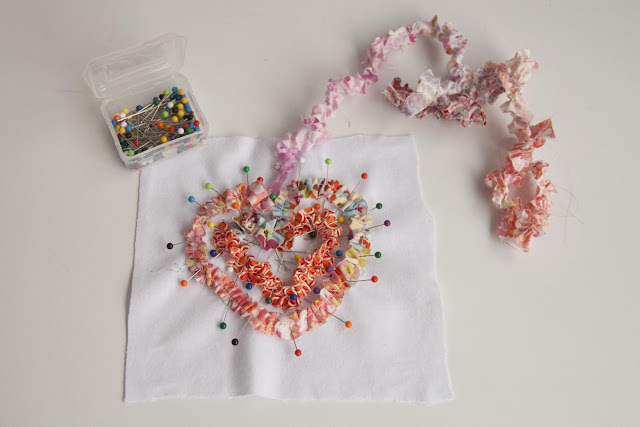 I wanted to use several different patterns for this particular applique but you could of course make one with just a single fabric or two, or three. To start, cut a bunch of .5" strips ON THE BIAS. 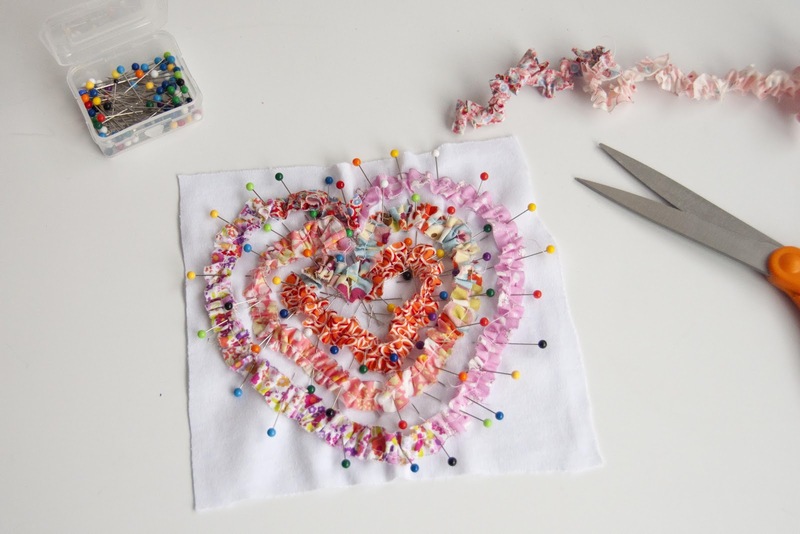 They can be various lengths as you'll sew them together, and a variety of lengths will actually be a better thing if you are mixing up the fabrics. 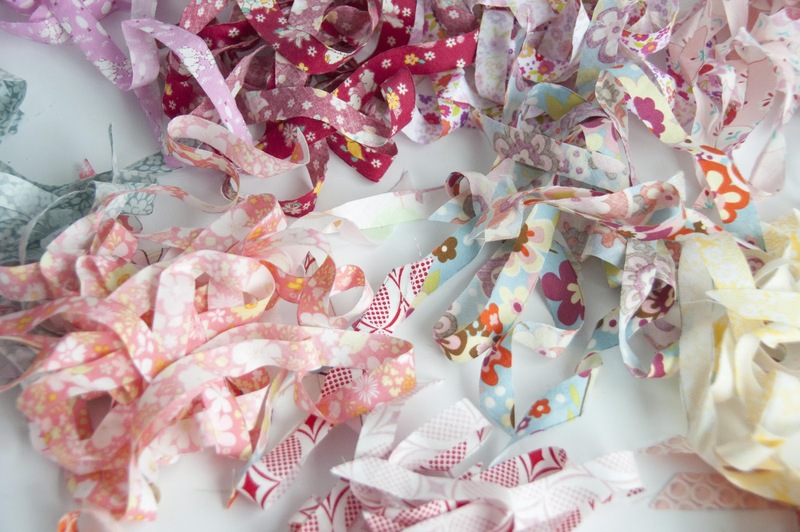 Pick your selection of fabric strips and sew them together along the short ends. Trim the seam allowances close to the seam 1/8" inch or so. 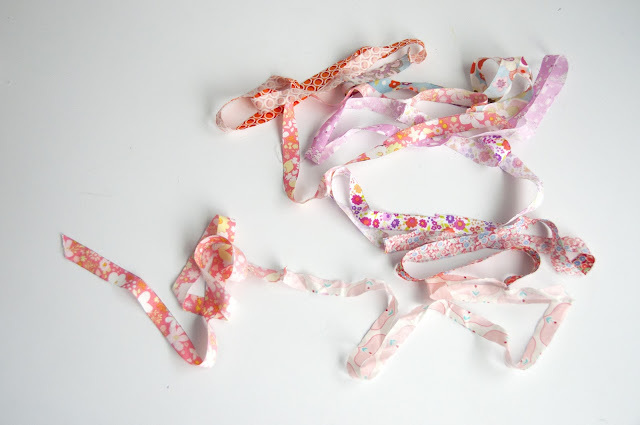 You should have one long pieced strip. I started with one about 4 yards long, but you'll need more or less depending on what shape you are creating. Now adjust your tension on your machine (I used a "9") and lengthen your stitch for gathering. 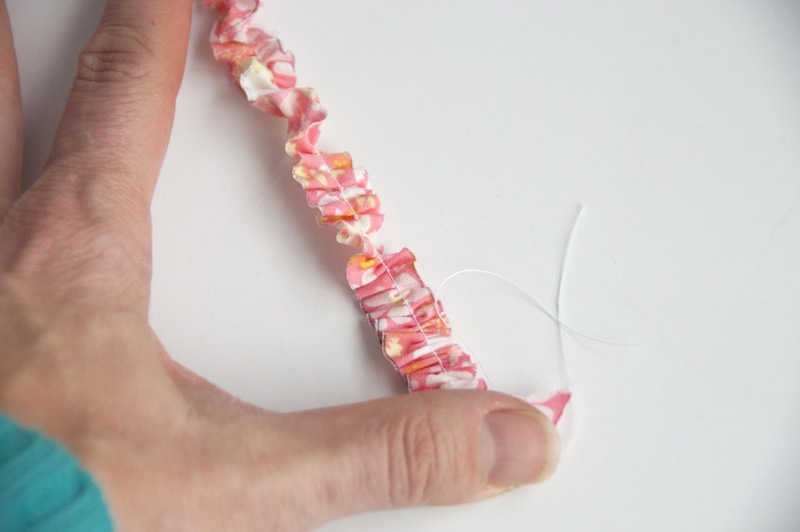 Stitch down the center of your entire length of pieced strip to gather it. I decided to make this applique on a separate piece of white knit fabric. I cut out a piece a bit bigger than the applique I had planned and ironed on some HeatN'Bond on the reverse, then removed the paper backing. 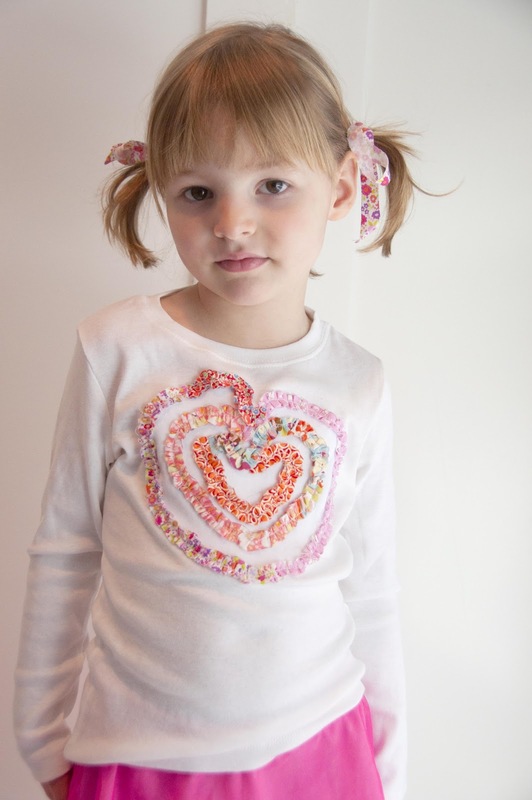 If you would rather, you can sew the applique directly onto the t-shirt. I would recommend using some lightweight fusible interfacing on the reverse of the t-shirt to stabilize it. Using a pencil or fabric pen draw a small heart in the center of your applique area. 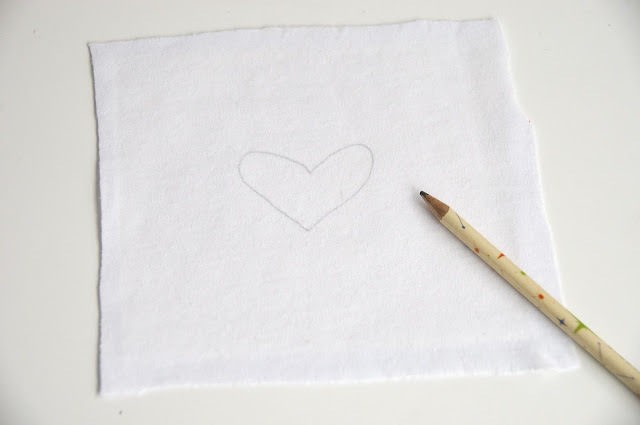 Start small enough so that you can add subsequent "lines" of fabric around this initial shape but not so small that you aren't able to wrap the fabric around it. Plus I like some white space in the center. 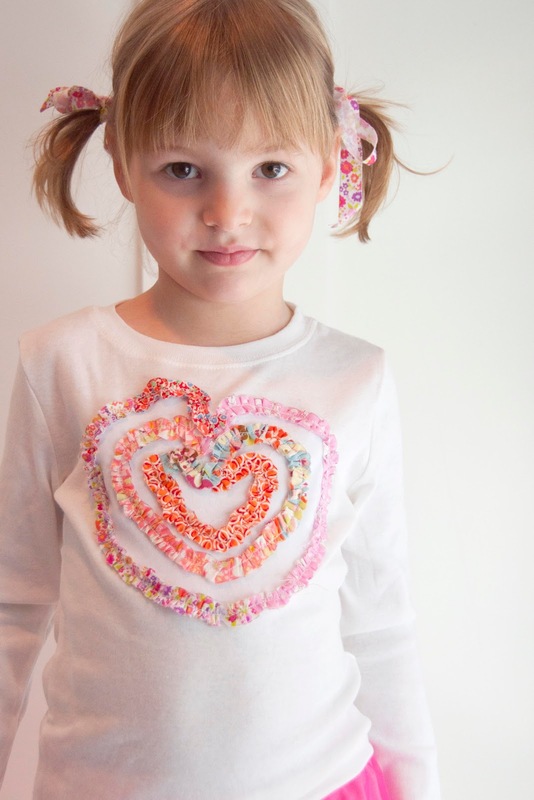 I pinned three rounds, or hearts and then clipped the fabric strip where I finished. 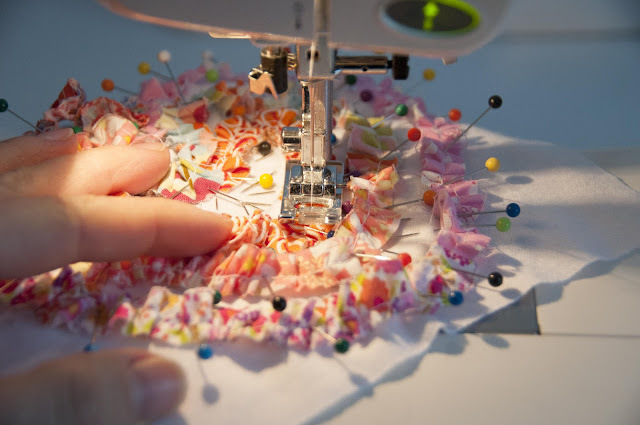 Carefully move your pinned shape to your sewing maching and stitch down the center of the ruffled fabric strips to secure the shape to your knit fabric. Don't forget to adjust your tension back to normal and use a regular stitch length, and be careful of all the pins. Remove them as you come to them and sew slowly. 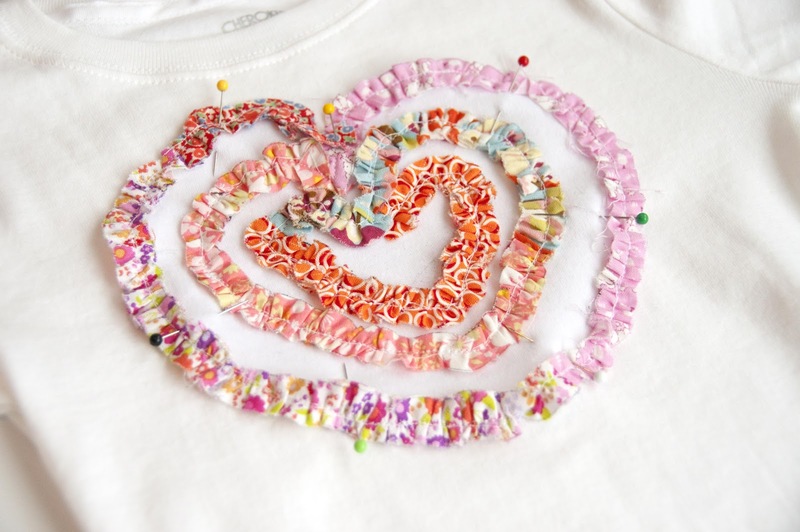 If you are working directly on a t-shirt, when you are finished stitching you can stand back and admire your work! 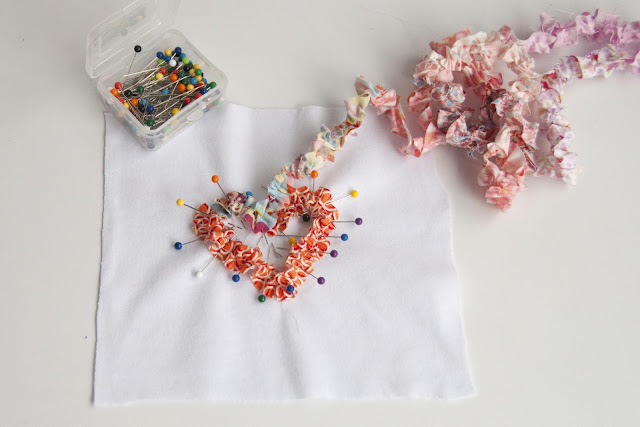 If you are creating this applique on a separate knit piece, trim the knit close to the outer stitching line, then pin the applique onto the t-shirt and stitch along the stitching line on the outer ruffled shape. Iron to activate the HeatnN'Bond. Ok, now you can admire your work! Valentine's isn't my favorite holiday either. 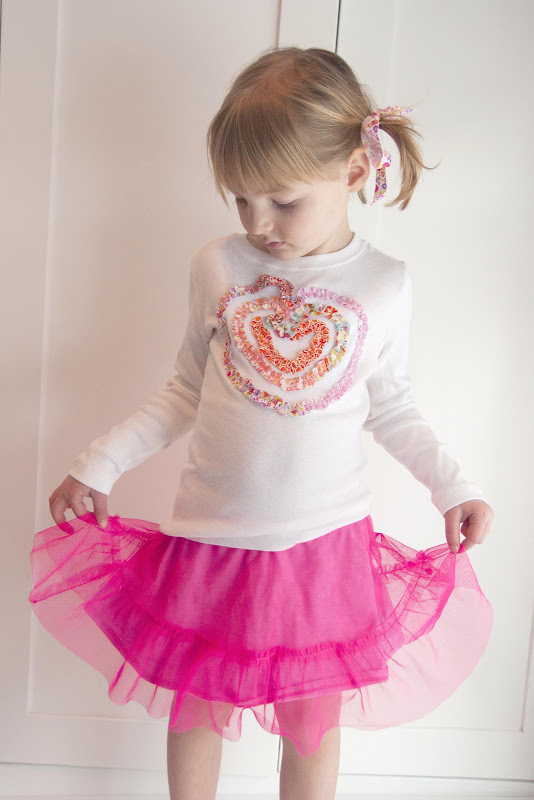 But I made a skirt for my daughter, which she loves. I have a feeling she'll be wearing it way beyond Valentine's Day! 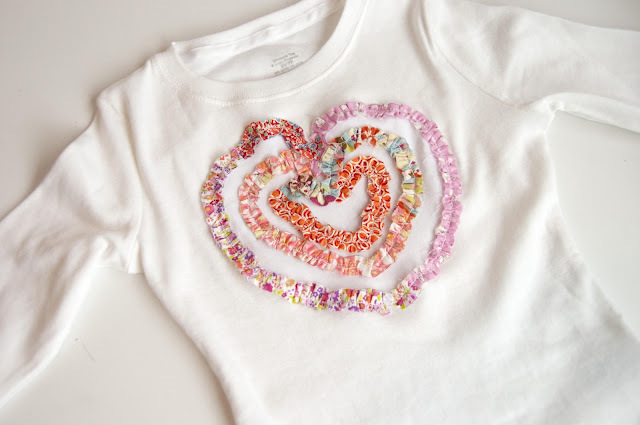 WHAT A CLEVER IDEA, ruffled hearts, to decorate the front of a plain white T-shirt-- to wear on Valentine's Day & all year 'round! 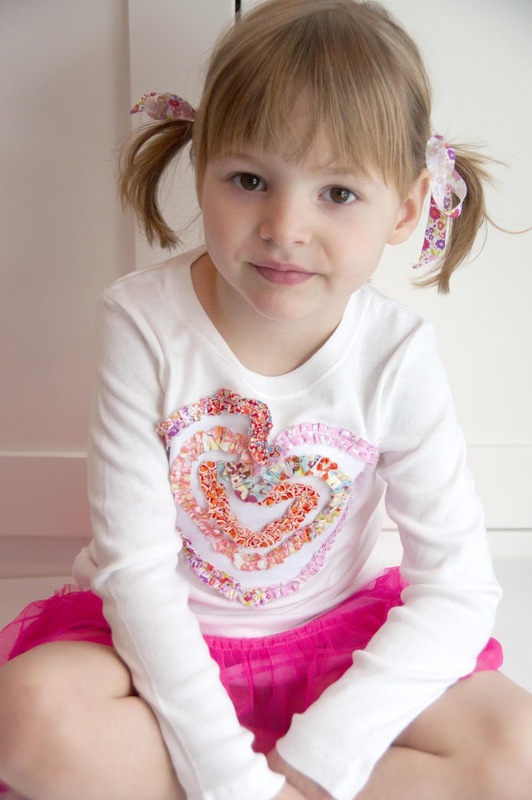 FAB photos of Scarlett! 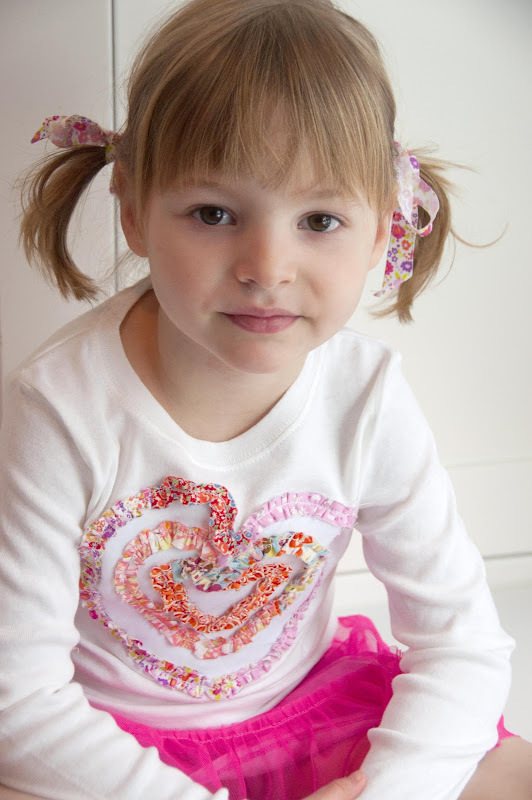 Your portraits of your young daughter modeling are so professional. 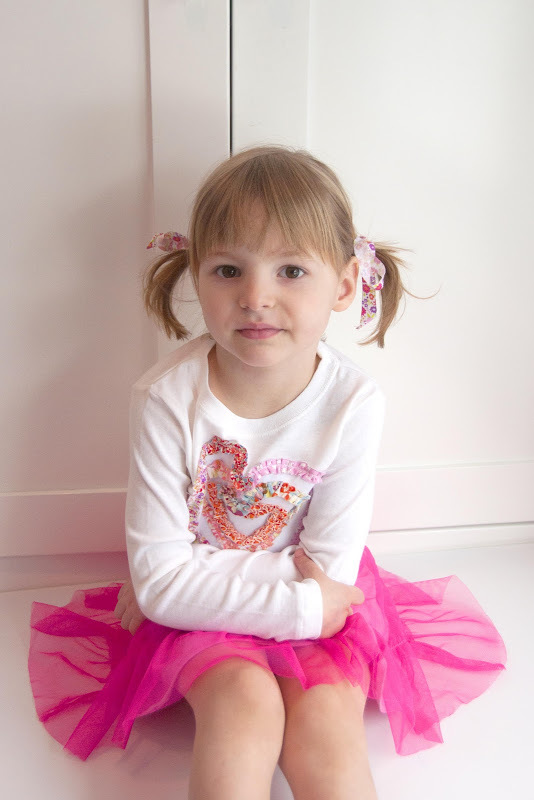 I think it's great how you show creative & AMAZING clothes for your 3 girls! You are such a wonderful Mother. Thank you so much for sharing this tutorial. It's just the thing my granddaughters will love. @Stan nel: The edges do fray a bit, which is part of the fun. So yes, be sure to cut the fabric on the bias so that it frays nicely (no strings). Thanks for asking.